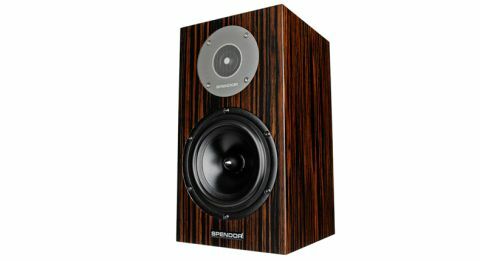 Spendor D1 review | What Hi-Fi? Spendor’s D-Line of speakers currently boasts a perfect What Hi-Fi? Sound and Vision record. The D7 is a five-star floorstander and was the sole model in the range - until the pint-sized D1 was announced. Can these new Spendors extend the record? Lined up next to their rivals, the Spendors give the impression of a featherweight boxer who took a wrong turn and stumbled into a heavyweight bout. The fit and finish of the D1s are superb, but the size difference is quite apparent. We wouldn’t be surprised if you could fit both Spendors inside one PMC Twenty 22. But size isn’t everything, and their compact dimensions will be a blessing for those where space is at a premium. Being a sealed cabinet, they’re also less fussy about positioning than the Dali Rubicon 2s and B&W CM6 S2s - although we’d still stop short of pushing them right up against a rear wall. Like other hi-fi speaker manufacturers, Spendor gives you the option to buy its own speaker stands. £595 seems a little steep, but we couldn’t find a cheaper alternative that allowed the D1s to sound better. Spendor claims the novel tweeter design (which positions a very thin micro-foil in front of the dome) actually evens out the tweeter output over a wide frequency range, and helps to aid dispersion. And this is one of the areas where the D1s score highly. Highs sound open, crisp and immediate and, if definition and analysis are high on your list of priorities, you won’t be disappointed. The leading edges and lines of notes are sharply drawn and cleanly etched. Lows don’t sound especially weighty, nor do these D1s plummet as deep as some rivals. The small cabinet does have a large say in what goes on further down the frequency range and bassheads aren’t going to be satisfied, but it isn’t all bad news. Clear and clean bass is the order of the day here. Play Paul Simon’s You Can Call Me Al and there’s no sluggishness. Each pluck of the bass guitar sounds taut and precise. But for all this precision, the Spendors don’t really capture the essence of the track. And we’re not talking about the fact the Spendors don’t go as loud as some rivals, nor is it purely down to a lack of bass weight. It’s a deeper-rooted issue: it feels like you’re not quite getting the full picture in terms of dynamics. There’s a lack of excitement and soul to the song, and before you know it, the track passes you by. Switch to Earth, taken from the Gladiator OST and the sweeping mid and upper frequencies just don’t have the same impact as when heard on the likes of the PMC Twenty 22s. The shift in dynamics as the tune sways back and forth is more apparent elsewhere in this test - the D1s just don’t capture these elements particularly well. You can counter this to a certain degree by taking extra care over partnering electronics. In this instance, the extra solidity and weight of an amp like the Roksan Caspian M2 makes good sense. Partner this with the D1s and you inject more body and weight. In turn, this leads to a slightly more balanced sound but it still isn’t perfect. The D1s are dainty and detailed speakers, but they’re hampered by a lack of dynamics and they struggle to hold your interest long-term. Add to this their relatively high price and we can’t help but feel a little disappointed.